Typically, soaring summer temps usher in shorter, skin-baring hemlines--but, evidently, not in Paris! 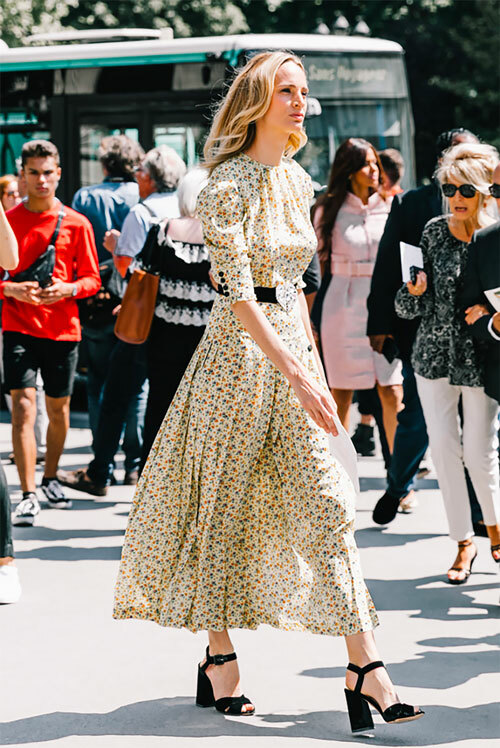 Currently, couture fashion show attendees are going long, opting for calf-grazing dresses and skirts, and the look is both cool and elegant. Proof in these pics here! I'm happy to go a la francaise with these (fall-friendly) beauts by Self Portrait, Rixo London, Tibi, Rebecca Taylor, Marchesa Notte, H&M, Endless Rose, and Cynthia Rowley. LOVE! Can you ID the designer of the first dress in black and white? Thanks in advance for your help. Lovely! I always love your posts :-). Do you know who makes Jeanne Damas' shoes? These photos make me so excited for Pre-fall! I love the longer length skirts. They are so chic!! I believe the black and white dress is by Dior.